Bruce Wang, MD, Assistant Professor, Department of Medicine – Gastroenterology, University of California, San Francisco (UCSF) is a member of the Porphyrias Consortium, a NIH sponsored Rare Disease Clinical Research Consortium which intends to integrate translational studies of the porphyrias with clinical trials testing new therapeutics. Dr. Wang received his medical degree from UCSF and completed a postdoctoral fellowship at Stanford University. Mary, a patient living with acute hepatic porphyrias (AHPs), first started to experience attacks in her late 20’s. Once her porphyrias attacks became more frequent and unpredictable, participating in the work and activities she loved became almost impossible because she was constantly in severe and debilitating pain. Now Mary is a passionate advocate for the porphyrias community and is dedicated to raising awareness of this rare disease. 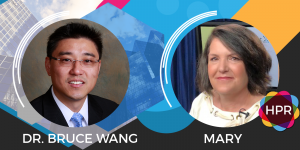 Segment Overview: Dr. Bruce Wang and Mary, a patient managing AHP, discuss Acute Hepatic Porphyrias (AHP), caring for patients with AHPs and the latest AHP research. To learn about one option for genetic testing, visit AlnylamAct.com. Alnylam Act is a program that offers genetic testing and counseling programs at no charge to patients. Neal Howard: Welcome to the program. I’m your host, Neal Howard here on Health Professional Radio. Glad that you could join us. Imagine feeling isolated, like your life is being taken over by painful and debilitating symptoms. Our guests today are Dr. Bruce Wang assistant professor at University of California San Francisco and a patient Mary who is living with AHP. Welcome to the program both Dr. Wang and Mary. How are you both? Dr. Bruce Wang: Thanks for having us. N: Now, I mentioned that you are assistant professor at the Department of Medicine at University of California. Give us a little bit of background about yourself above and beyond. W: Sure. So I’m a gastroenterologist at the UCSF Medical Center and I specialize in seeing patients with porphyrias including management of patients with the acute hepatic porphyrias. N: And Mary, when were you first diagnosed with this condition? M: I was 28 years old when I first got sick. I had 12 attacks over 18 months before a doctor thought of porphyria and tested me for it and diagnosed me. N: Doctor, why is it that many patients go for long periods of time being undiagnosed or misdiagnosed when they have such profound symptoms? W: Yes. So a couple of reasons for that. The acute hepatic porphyrias while they are genetic disorders, the acute attacks typically do not come on unless there is an inciting event, a trigger such as the administration of a new medication, fasting with a crash diet or in some women hormonal changes with their monthly cycles. And so typically patients present with episodic acute attacks that may occur sporadically over time. That’s one reason it’s not easy to diagnose. The other one is that, it’s a group of rare diseases. We think that as few as one in 20,000 people will have acute porphyria attacks during their lifetime and as a result most healthcare professionals including physicians do not think of this disease, this diagnosis when patients present with symptoms consistent with acute attacks. And I would say the third reason why this disease has been difficult to diagnose is that the symptoms of acute attack which are primarily severe abdominal pain, nausea but also include other neurologic symptoms like weakness, numbness and mental status changes. These are symptoms that are very nonspecific and can mimic other much more common disorders which is why it oftentimes goes undiagnosed. The amount of time when acute porphyria patient first presents with an acute attack to when they were diagnosed in the United States is 12 years. N: Mary, give us a little bit about your journey. Did you know anything about this condition before you were diagnosed? And a little bit about what was going through your mind when you started having symptoms. Were you thinking it was something a lot less severe than it turned out to be? M: I had no idea what was going on. We had never had porphyria in my family. I had taken Sulfonamide antibiotic and on the 4th or 5th day, I had excruciating abdominal pain, weakness, body pains and I ended up passing out and having to go to ER. Over the next 18 months, I then had 12 more attacks. Every attack even though I was treated well by the doctors I’m usually hospitalized and given multiple tests, scopes and scans and MRIs and 10 bottles of blood at a time. They were looking at the results and telling me, I’m a perfectly healthy woman. And the pain, a morphine pump doesn’t even touch the pain and they’re telling you you’re perfectly healthy. So as the doctors start questioning you, you start questioning yourself. Even though you have some physical signs that there’s no way you can make up like port wine colored urine, the doctors still want you to go to the psychologist for a therapeutic review and different things like this. And so they’re questioning your sanity and you start to question your own, like, “Is this real?”, because everything, all your test looks perfect because they just haven’t thought to do the right test yet. N: When the right test was finally done was there anything that you said? I mean, did you just put your foot down? How did you finally get the proper diagnosis? What was that one factor that made it all come together for you and your physician? M: Luck. Seriously, I was in the ER and I had given a urine sample and a doctor walking down the hallway, picked up the urine cup and made a joke to the nurses that they shouldn’t be partying in his ER and drinking wine from the urine sample cups. M: And I yelled out into the hallway that that was my urine. He came into my room and asked a few questions, asked if I ever heard about porphyria. And it had just so happened. He had seen a movie about porphyria 3 nights prior and that’s what made him think of it. There’s only one paragraph about porphyria in med school. So doctors they’ve read that and they forget about it. N: Absolutely. With that being said, Dr. Wang, with so little information being out there at the onset of a person’s medical career, what in your experience have you seen? Is it no respecter of person? W: People of all races are affected by the acute hepatic porphyrias but it is a disease where the acute attacks occur disproportionately in women. So 9/10 people with acute attacks are women and there’s also an age distribution where it’s really only during the reproductive years in a woman’s life where there are most at risk for developing an acute attack. N: And does that have any correlation with development early on in puberty or anything? Is there anything on the horizon that you can see as an early detector? W: Yes. There’s still a lot that we are trying to understand about this disease but it’s fairly obvious that hormonal changes most likely progesterone changes, changing levels progesterone in the body are a significant trigger for acute porphyria attack in patients who carry mutations in the AHP genes. That’s pretty clear based on the research and the clinical data that’s available. N: Now, Mary, what type of support have you been able to come in contact with and how have you been able to help maybe some other people like you’re doing today? M: Well, the American Porphyria Foundation started Porphyria Awareness Week and that’s why we’re here today. The support that they have on their website with comprehensive information about porphyria, kits that you can have, send to your doctor if you want testing or you want him to think about porphyria. The porphyria can source them through the NIH and all the different porphyria clinics that we have now across the U.S. are really starting to help us patients and advance research so those of us like me who have frequent attacks or who have become chronic. We’re finally starting to be hopeful for the future. N: Dr. Wang, Mary, it’s been a pleasure both of you. Thank you for coming in and given us some great information concerning AHP. It’s been a pleasure. I’m hoping you’ll come back. W: Thanks for having us. N: Thank you. You’ve been listening to Health Professional Radio. I’m your host, Neal Howard. To learn about one option for genetic testing, visit http://www.alnylam.com/. Alnylam Act is a program that offers genetic testing and counseling programs at no charge to patients. Transcripts and audio are available at hpr.fm and healthprofessionalradio.com.au.